The Great Get Together is taking place on 17-18 June this summer. The event is being organised by the family and friends of Jo Cox and coincides with the anniversary of Jo’s death. The Great Get Together hopes to be a national moment of unity with people and communities coming together to share food in barbecues, bake offs, street parties and more. It’s completely non-partisan and open to all. 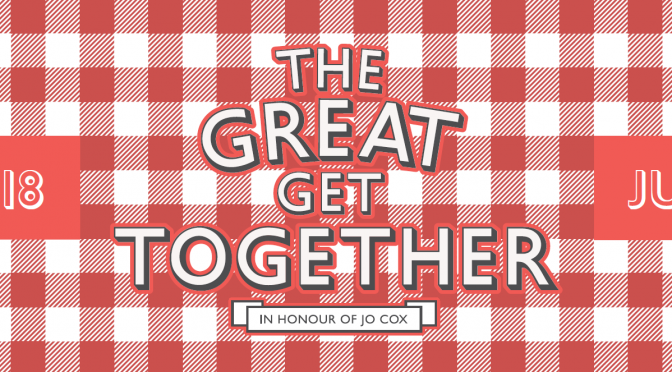 The Great Get Together already has the support of a growing coalition of organisations including The Big Lunch, The Women’s Institute, Girlguiding, The Scouts, The Premier League, The Royal British Legion, The Archbishop of Canterbury, the Chief Rabbi and other faith representatives. I hope your organisation can lend its support.